Technical diving contains a bewildering array of decompression terms - m-values, gas gradients, deep stops, bubble models and gradient factors are all terms that you may have come across but have no idea what they mean. When it comes to deco theory, Mark Powell literally wrote the book - winner of the acclaimed 'Publication of Significance' at Eurotek 2010, his book Deco for Divers has rapidly become a 'must read' for all divers! 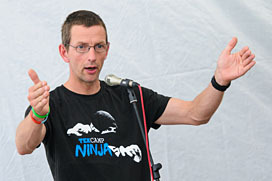 In this talk Mark will explain what all these concepts mean in plain English and what they mean for our dive planning. You'll learn how the different decompression models work and how you can adjust their parameters to 'shape' your decompression curve. Even more importantly he will explain what all those expensive tech diving computer are actually doing and whether we need them or not. For divers wanting to gain a basic understanding of decompression theory, Mark's talk is not to be missed. 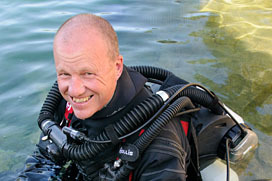 Mark Powell has been diving since 1987 and has been teaching since 1994. He has been a full time technical diving instructor since 2004 and teaches exclusively for Technical Diving International. 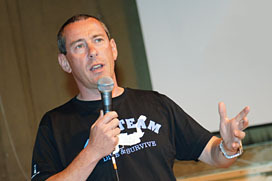 He is a contributor to Sport Diver Magazine in which he writes a regular column on technical diving. In 2008 Mark published Deco for Divers, a widely acclaimed overview of the theory and physiology of decompression. This has quickly become the standard text on the subject and is recommended reading by a number of the technical diving agencies. 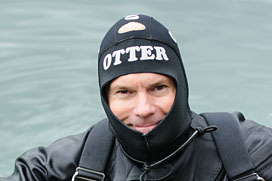 GUE instructor Richard Walker has been diving in Norway for many years. The stunning fjords, mountains and rugged coastline of Norway offers world class diving that draws divers from around the globe to its shores. He has dived on many of the wrecks from Bergen, Sognefjord, �lesund and as far North as Narvik, 200km into the Arctic circle. Many of these wrecks have significant histories, from being part of Hitlers Operation Weserubung, the code name for the German invasion of Norway in 1940, or part of the general losses of the war. The talk will be a real feast for the eyes, featuring many photographs from these wrecks, along with some of their history. Rich Walker started diving in 1991 and soon found himself spending all his spare time exploring the shipwrecks off the coast of the UK. Rich is the Technical Training Director for GUE and he also sits on the Training Council and is able to teach all GUE recreational and technical classes up to Tech 2. He is also an instructor evaluator at all recreational levels and to the Tech 1 level. 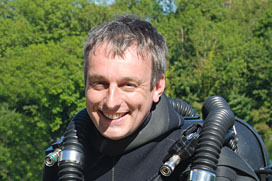 Rich is a keen cave diver and enjoys exploring caves both here in the UK and abroad. Ever wondered what it takes to organise a cutting edge diving expedition? No strangers to such projects themselves, explorers Rich Stevenson and Martin Robson provide a fascinating inside into the logistics and procedures that form the foundations of any successful expedition. Acclaimed deep wreck diver Rich Stevenson looks at the subject from the perspective of deep wreck exploration whilst acclaimed cave explorer Martin Robson takes on the subject from a slightly different slant with an overview of what's involved in the planning and execution of an expedition to explore a virgin cave system in a remote location. As cutting edge explorers in their own right, no one is better placed to provide an insight into the challenges and pitfalls of expedition planning. 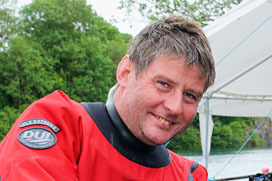 Martin is one of the UK and world's most experienced instructors and teachs courses from IANTD, TDI, PADI and both NACD & NSS-CDS. Martin sits on the IANTD Board of Advisors and is also an NACD Safety Officer and a Technical Field Consultant for PADI's range of rebreather programs. Martin specialises in extreme environments and regularly teaches courses such as expedition trimix, ice diving, advanced cave and technical wreck to instructor level in environments from the arctic to the equator. Rich Stevenson has been involved with deep wreck and cave diving since the early 90's and has been lucky enough to train as an instructor with some of the world's leading instructor trainers including Tom Mount, John Orlowski, Kevin Gurr and Rob Palmer. More recently, Rich has turned his attentions to media and TV and now runs Diving & Marine Solutions - a successful consultancy service for media productions dealing with all aspects of underwater TV and Film production. He has worked on a number of high profile projects for the BBC, ITV and Channel 5. Phil recounts the adventures of caving and diving in some of the world's true wilderness areas and closer to home in Europe and the UK over the last 20 years. His adventures are liberally expanded with all the scary and thoroughly daft moments - from traveling through the Boreal forest in the Ural mountains of Russia to crawling around in the mud deep beneath the 'Queen Victoria' pub in Priddy Somerset, all illustrated with some beautiful photos and video - all delivered with Phil's signature witt and humour! Rest assured that once you've heard this talk, you'll be left wondering how many of his 'nine lives' Phil still has left! A true 'boys own' talk that is not to be missed! Acclaimed technical diver and marine engineer Kevin Gurr dispels some of the myths surrounding closed circuit rebreather diving. 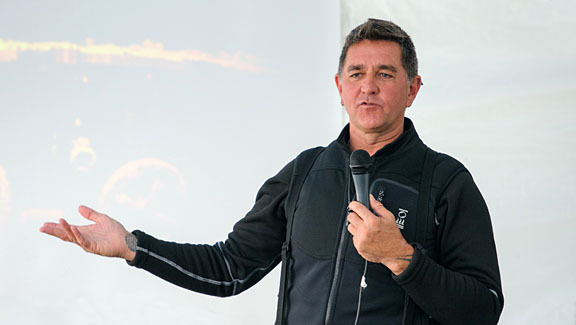 A pioneer in rebreather design and development, Kevin's presentation will allay many of the fears, concerns and misconceptions that many divers have regarding rebreathers. Do pre-dive checks actually work? How do we stop the 'Bad Days'? Kevin will also review several rebreather and non-rebreather projects he has been involved since the early days of technical diving and look at some of the lessons learned.